Asterix has been around since first being published as the main character of the French comic that shared his name in 1959. Over the years there’ve been a few dozen comic magazines released in the franchise. There’ve also been a dozen films, both animated and live action to reach the silver screen. That brings us to today with Asterix: Megaslap. Roman soldiers are trying to invade Gaul territory again, and it’s up to you to send them packing. So how does Asterix: Megaslap hold up? Is this a solid shot or should it have the taste slapped out of its mouth? Let’s find out. 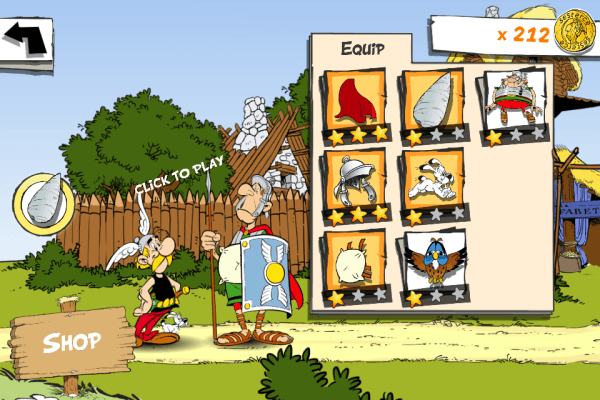 Asterix: Megaslap is your typical, casual how-far-can-you-launch-item-x game. With breeding stock that goes as far back as games like Kitten Cannon or, even more honorably, Scorched Earth, it should come as no surprise that physics play a meaty role in how the game operates. What does Asterix do to set itself apart, though? For starters, the launching mechanism is somewhat unique. As the hero of Gaul, you’ll be winding up for a massive punch right to the Roman soldier’s dome, so Bulkypix incorporated a mechanic where you spin your finger around and around to charge a meter. When it hits the point you want, you let off the spinning and throw your finger at the angle you want the soldier to fly. He sails through the air with the greatest of ease, but when that soldier hits the ground, inertia hits him hard, greatly diminishing his speed and, ultimately, causing him to stop. There are a few things along the way you can do to keep him going, though. As you finish each launch, you’ll earn money and experience. As you gain experience and levels, you’ll unlock new items you can buy to help out. These items will typically help you send the centurion ever further, though some have mildly random effects. For instance, you can buy and equip a cape to give him more air time, a helmet to protect him from ramming things, a pillow to ease his encounters with the ground, and more. They range everywhere from practical to silly (helium potion that could potentially slam him into the ground straightaway, anyone?) and give you a reason to keep playing for a while. Before each round, you’re given a list of objectives. Bounce on 1 Gaul, crash through 10 gates, and so on. Completing these will earn you extra cash to upgrade or continue to buy new items. It’s a neat distraction, but ultimately nothing you’ll want to invest much time in chasing. At the end of the day, chasing the high score is your only real drive to keep going. If you’ve got other friends playing, you can tie the game in with your Facebook account and chase one another’s scores. 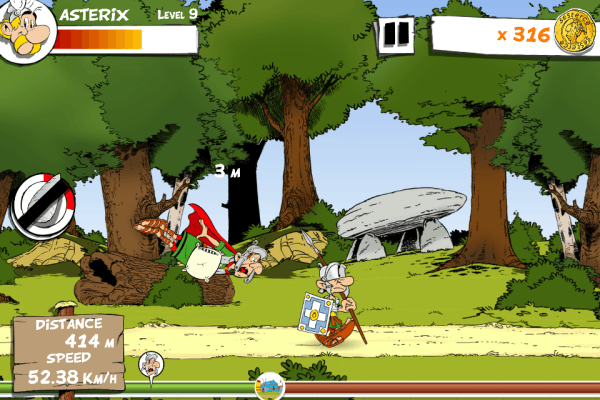 The visuals in Asterix: Megaslap are right down the alley for fans of the comic series. The bright colors and cartoony graphics are all right on par with the style of comics. Beyond that, the game looks fine in motion, but it will do nothing to blow you away. The music has a light-hearted, cartoony feel to it. 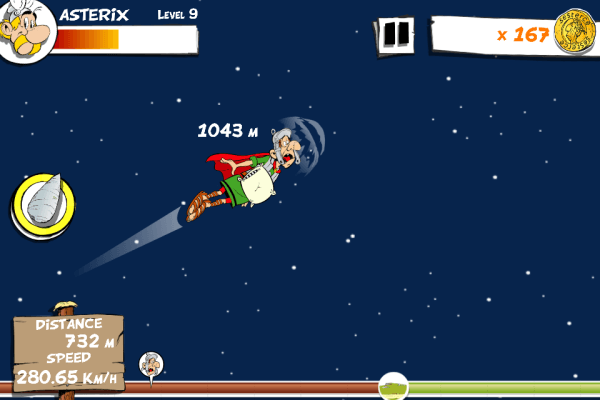 It fits right in with a game where you can punch a man several miles in a swing. The sound effects are serviceable, but the incessant rattling knees and nervous whimpers coming from the Roman soldier quickly become obnoxious to the point of muting the game. 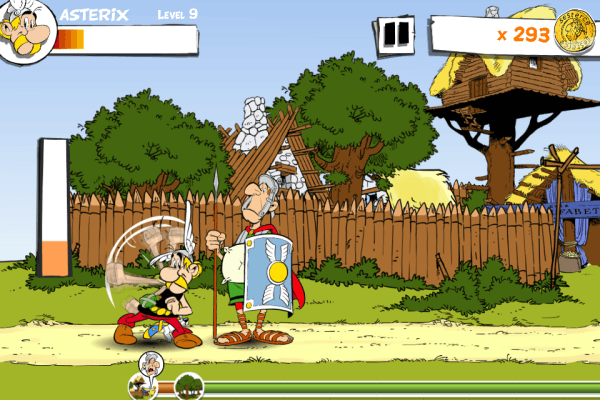 Overall, Asterix: Megaslap is a light distraction that will keep you occupied for a few minutes. 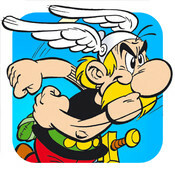 Fans of the Asterix stable will get a kick out seeing the Gaul lay it to the invader. The forgettable music and annoying sound effects won’t help keep it around, though. If you’re looking for something to pass the time without much mental investment, Asterix will serve in a pinch, but you’d probably have more fun reading the comics.